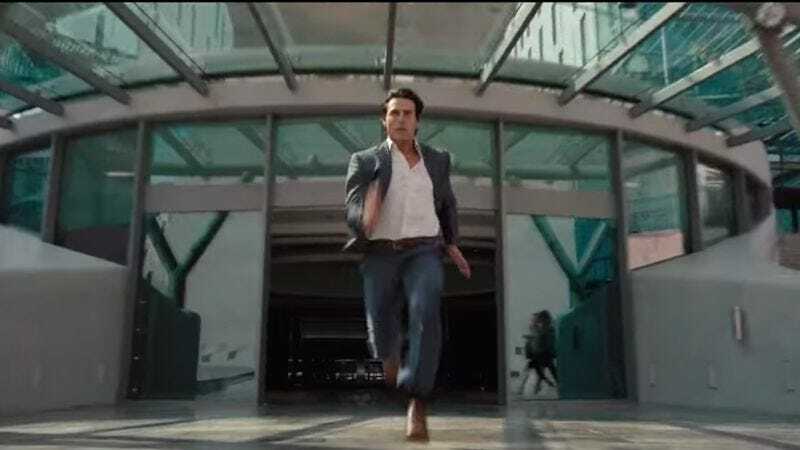 When you strip the average Tom Cruise movie down to its essence, what you generally end up with is a charming and relatively short guy who just can’t stop running. Whether he’s trying to save people, make it to an important meeting, or prevent some future-crime, he always prefers to get there with a full-on sprint. That might not make him unique among people who tend to star in action movies, but he definitely does it often enough for it to be “a thing.” Case in point, YouTube channel Burger Fiction took nearly every Tom Cruise movie and stitched together just the scenes of him running, resulting in almost 19 minutes of a charming, relatively short guy doing what he loves the most. It’s funny on a conceptual level, but it’s also pretty interesting to see which movies have very little running and which seem to be all about running. For example, The Firm and Mission: Impossible III seem to be almost entirely built around Tom Cruise running. Then there’s Edge Of Tomorrow, which has the honor of being the one movie in the supercut where Cruise actually dies while running, while Mission: Impossible—Rogue Nation features the rare running sequence where Cruise has a buddy running with him. The full supercut is below.